The Chicago Bears and Baltimore Ravens have become the face of rough, hard-nosed defenses amid the ever-growing popularity of high-powered offenses that threaten to score from all areas of the field. And each has quarterbacks completely capable of putting up points, but both heavily rely on their stifling defensive units. That’s where the Houston Texans can separate themselves from the pack with a top-rated defense and signal-caller. Few expect the team to make a run in the playoffs, but their defense has proven it can be just as dominant as any other. The darkhorse unit enters the postseason needing to beat prolific offenses to advance, and the first test is a familiar opponent in PFF’s Comeback Player of the Year: Indianapolis Colts quarterback Andrew Luck. The Texans are one of two teams to have four defensive players who have 900-plus snaps and an 80.0-plus overall grade (the other being the Bears). That alone proves the sheer talent they have on that side of the ball, with J.J. Watt, Jadeveon Clowney, Kareem Jackson and Benardrick McKinney all hitting the mark. Having already played the Colts twice in the regular season (splitting the series), Clowney and Watt know exactly what they’re up against in PFF’s third-ranked offensive line. The duo has previously terrorized the Colts’ front, notching 24 of the Texans’ 34 combined pressures in those prior two meetings. However, Luck fared decently under pressure, posting a 72.4 passer rating when facing heat in those games (not far off his season average of 73.4). If Luck can perform admirably under pressure in Saturday’s third and final matchup between the AFC South foes, where can the Texans’ defense have an impact? The responsibility will largely fall on the shoulders of cornerbacks Johnathan Joseph (80.4 overall grade) and Kareem Jackson (85.7 overall grade), who will likely see the majority of their snaps guarding T.Y. Hilton and Chester Rogers, respectively. Both receivers own passer ratings when targeted of 95.0 or higher, however, neither Hilton nor Rogers have caught touchdowns against the Texans this season. The Colts still have other receiving threats to rely on, though, such as tight end Eric Ebron, who led his position not only with 13 touchdowns but also with three touchdowns on targets of 20 or more yards downfield. The Texans’ defense can generate pressure at a high rate and limit top receivers, which leaves one important facet the NFL’s second-best defensive unit (90.3 grade) will need to emphasize if it wants to claim victory Saturday: the run game. Jackson was the league’s fifth-highest graded cornerback in the regular season, but much of that was due to stellar run defense, in which he earned an elite 91.1 grade, second among cornerbacks. Count on Jackson, who racked up the second most run stops at his position to excel against a Colts’ running game that has struggled in forcing missed tackles and breaking away for large chunks of yards. Clowney and Watt have also made their impact felt in against the run, with both ranking in the top-10 in run-stop percentage among edge defenders. As a team, the Texans are third among playoff defenses in yards allowed after contact on runs, surrendering an average of 2.34 yards. 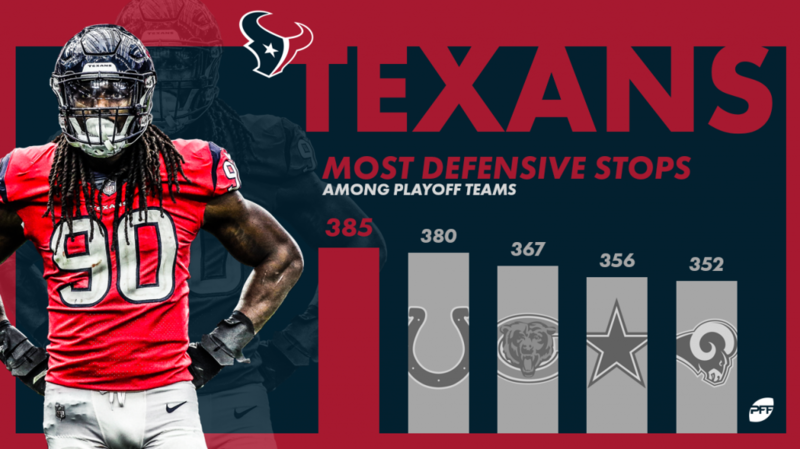 With 385 stops, a stat that constitutes a “loss” for the offense, the Texans’ defense is second in the NFL and first among playoff teams. So, while the flashy defenses in the playoffs continue to garner praise, the Texans’ remains a darkhorse. And darkhorses are known to deliver on the biggest stages.